Beyond the Basics: Transferring Ciné Film to Video. Use the links in the text to move between sections. 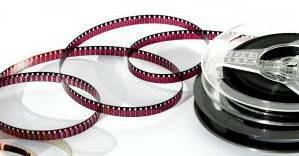 In very expensive labs cine film can be scanned frame-by-frame to make a top-quality electronic copy of the pictures. That approach is not practical for amateurs, but very good copies can be made by other means. The main problem is that PAL video works with 25 pictures per second and NTSC video at 29.97 pictures per second, whereas amateur film was shot at various speeds. In the earliest days cameras were hand-cranked, the first clockwork motors could be variable so speeds were not always consistent. Things improved when electric motors were introduced to cine cameras. 9.5mm film and Standard 8mm mainly ran at 16fps (frames per second). Super-8mm mainly ran at 18fps. Some Super-8mm and most 16mm ran at 24fps. This means some compromises have to be made when transferring from film to video. In 9.5mm and early Agfa 8mm it was possible to put a notch in the film when a caption was shot. Projectors held any notched frame steady for 10 seconds before going on. That saved film but gives us transfer problems. 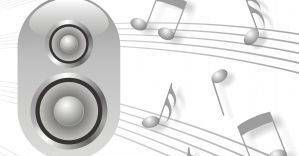 In theory it is possible to transfer picture and sound together, but in practice it is much easier to transfer them separately. For our purposes the aim is to get both picture and sound into our computer editing programs where we can adjust speeds, "hold" frames, tweak brightness, contrast, colour and so on as necessary. This article assumes we will record the pictures onto video in our camcorder and later transfer them to computer. It is possible with most cameras to connect them directly to computer with a Firewire cable and thus record the images into computer immediately. In practice this usually adds complications. Unless you plan to transfer a great deal of film to video it is simpler to record to camera and then transfer to computer, even if this adds a bit to the turnaround time. This is the usual system that amateurs use. Part 21 - Transferring Cine Film to DVD describes this system in detail. Don Chapman and I used this system. On several occasions we copied the film to a video camera digital tape in one pass with what I can call perfect results. Most of them, however, required several passes and a lot of editing in a computer. We had expert advice from Nev Long and Alan Beale, but there was a lot to learn. Bill Rahmman found someone in Melbourne who repairs 16 mm Projectors - Bill’s 16 mm projector now works perfectly. A tip from Alan Beale prompted Bill to mark a black framed rectangle on a white screen. I could now easily aim and correctly zoom my video camera to the required position. Bill is a gadget man, so we can now easily control the projector speed and as his 16 mm projector is in good condition, we are now copying 16 mm film onto the video camera tapes, every time in one pass. The stroboscope that is used to check the projector speed has a bright LED which is the best light to use, as it only flashes on positive half cycles. For 16 2/3 fps (frames-per-second) you then need 3 black bars on the strobe. For 25fps you need 2 black bars. If you use a neon lamp instead of an LED it gives 100 flashes per second so you would need 6 and 4 black bars respectively. You need a film projector in good condition - and you need an effective means that will adjust the projector speed to 16 2/3 frames-per-second for a three-bladed shutter or to 25 frames-per-second for a two-bladed shutter. 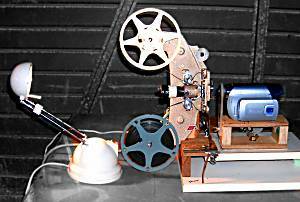 A film projector with a fixed speed motor. This needs a high wattage variable resistor (50 - 100 ohm, 50 to 100 watt) that can adjust the electric power supply: less power makes it run slower, more power makes it faster. Such a device must be made and fitted by a competent person. There are dangerously high electrical voltages inside projectors. It is also important to understand that if the resister is not heavy duty, it will overheat, which allows more power through so that the shutter speed increases. In extreme cases an inadequate resistor could burn out. The Standard 8 projector we were using had a constant speed motor, but the shutter speed could be varied by moving a small lever. This slid a tiny rubber wheel across a disc in the drive mechanism. When the wheel moved closer to the disc centre the projector ran slower, when it moved further away the machine ran faster. The catch is that it did not adjust smoothly, it jumped. Getting the exact speed required was usually impossible. The first time, we fluked it. We didn’t know it was a fluke and later on we altered the setting, to our sorrow. One movie maker we know, sets it as best as he can and then uses a resister in the electric power to make fine adjustments to the speed. In System 2, when videoing Standard 8 film, we have a pulley of a suitable size on the electric motor, with a brake to fine tune the speed. Series wound variable speed motors could be used, but the speed varies a lot and you need a second person fiddling with the speed control all the time. The video picture had a slightly different colour from the film projected picture. I now know that to correct this, I should have re-set the white balance on the video camera. Try the indoor setting or use a blue filter placed in front of the video camera lens. Better still, white balance on the screen without the film in the gate. You need a dark room. You need to lock the focus on the video camera while a sharp picture is being projected. Holding a sharp print on the screen doesn’t work, the video camera will be slightly out of focus. There is a slight difficulty in adjusting the focus and exposure settings. While the focus must be locked - you can use auto exposure or locked exposure, whichever you prefer for whatever is necessary for various situations. The video camera has to be fixed on a tripod. The camera tripod is a nuisance, it gets in the way. Don Finlay made a bracket so as to attach his video camera to the projector stand. This also saves some setting up time. We carried out some experiements, with regard to projecting the film onto a screen. (a) A blue filter was held in front of the video camera lens - this adjusted the reds perfectly. (b) The video camera White Balance was set to Internal Lighting (Tungsten} - this adjusted the reds perfectly. (c) The video camera was White Balanced on the projector screen without a film in the projector gate - this gave a pure white on the monitor, so this will work satisfactorily. (d) While the video camera was White Balanced on the projector screen, without a film in the gate - I then set the Auto Exposure to Spotlight, so as to get a slightly darker picture, this made the reds too bright - using the Spotlight setting was not a good idea. Copy the original film sound or replace it? It is usually better to copy the soundtrack separately. All modern video editing programs make it easy to match up a separate sound recording with the pictures later. Do NOT try to copy the sound directly into your video camera. If the camcorder has a sound input socket at all - many don't - it will be intended for microphones. Microphones use tiny electrical signals. Any sound output you get from a projector or tape-player will be much too high and could seriously damage your camera. Part 21- Impedance of line level audio and microphone level audio shows how an Audio Mixer can be used to automatically adjust the volume of line level audio down to the weak signal that can be fed into a video camera, It will also automatically adjust microphone level up to line level volume. If you only have the film's sound to work with, try to get a projector with a "line output" socket. (These were often fitted so that sound could be plugged into a separate amplifier for shows in a big room.) Plug a suitable cable into the "line output" and connect the other end to your computer's "line input" socket. Be careful NOT to plug it into the computer's "mic input" socket. Usually the volume from a "line output" socket does not alter when you adjust the volume on the projector. Your adjustment must be done on the computer. On a Windows system double-click the loudspeaker icon in the system tray at the bottom of the screen to bring up a set of slider controls, one of which is for the "line in" socket. On an Apple system go Apple menu > System Preferences and click Sound. Click Input. Select the line input device. The input level meter shows you how loud or soft the sound from the selected input device is registering. Drag the “Input volume” slider left or right to lower or raise the input volume. By default you will not hear the sound through the Apple sound system. Go to Applications > Utilities > Audio MIDI Setup. Select the Audio tab at top. At the bottom left half of the screen, select Source: Line In. In the box below it, check "Thru". See Part 21 - The Process shows a diagram complete with instructions on how to reduce the volume of the line level audio so it can be fed into a video camera microphone socket. On the computer put the line-input slider very low and raise it gradually. Listen to what comes out through your computer's speakers. Your aim is to have the loudest sound on the film come across clearly without distortion. If the projector only has an output socket for a loudspeaker be very careful. The safest option is to buy a gadget that feeds the sound from there onto your computer through a USB port. (e.g. Griffin Technology iMic USB Audio Interface £32.95 in January 2010 from amazon.co.uk) If you are only transferring a couple of films and don't want to spend that much, plug a loudspeaker in using a lead that lets you put the projector into the next room. Set up your camcorder running near the speaker and run the film with the volume at a comfortable level. Transfer the sound from that "video take". Beware of Phase Cancellation. Speakers should not be placed close to corners of a room. There was a time when I shot a movie with the mic held up between overhead floor joists - I got a truck-load of phase cancellation from reflected sound off the sides of the joists. Keep in mind that home movies did not have high-fidelity sound. Once your have the soundtrack in your computer you can often "clean it up" with careful use of the sound filters in your video editor. WARNING: Audio signals from the output sockets of a projector, tape recorder, VCR, TV etc. are very high when compared to signals from a low impedance microphone, which has a very low signal. So, if you accidentally feed “line level audio” into a low impedance microphone socket you will blow something up: either your own ears or your equipment. The audio signals from all the movie projectors that I have seen so far are line level. "Line level" music and audio is high impedance. It is used to connect projectors, video cameras, VCR's, TV's, DVD recorders, DVD players, cassette players, computers etc. It is measured in many thousands of ohms. For stereo systems white is usually left and and red is right. "Microphone level" audio may be high or low impedance. Amateurs usually use low impedance microphones. When plugged into a video camera the signal is amplified and converted to line level audio. Headphones are of low impedance. Only plug them into headphone sockets. If you are messing about with cable adapters, don't connect headphones or speakers to line level audio. You will blow your ears up. This is the system the gadget men set up. You don't need a dark room, you can set the equipment up anywhere. You can easily lock the focus and easily lock the exposure on a still frame in the projector gate. The weak back light shining on the gate does not generate heat. Bill uses a quartz halogen, 12 volt, 20 watt desk lamp. The video camera is mounted on a frame that is attached to the projector. You don't have a camera tripod cluttering up the space. If the projector is in good condition, the lamphouse is removed and the video camera is fixed close to the projector and aimed through a magnifying lens onto the projector's film gate. 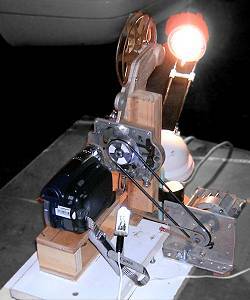 The 16 mm projector with its very heavy motor has a very stable speed and only needs an occasional slight adjustment. Standard 8 film projectors are a problem, the motors are not so heavy. Trial runs with standard 8 film In various projectors showed us that controlling the projector speed can be done - but it needs constant adjustment. Bill, the gadget man, has removed the film gate from a projector and has experimented with various electric motors. The film gate, the electric motor and the video camera are now mounted on a single frame. With projectors that have the take up reel at the back, you will need a couple of idler rollers to feed the film around the video camera to the take-up reel (see picture of 16 mm projector). With a projector that has the take-up at the front, you don’t need this (see second picture of 8 mm setup). 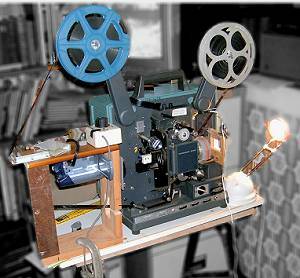 The picture shows a 16 mm film projector with the lamp house removed. The video camera is fixed in a wood frame, upside down. It is aimed through a magnifying lens onto the gate. A weak back-light is aimed back through the projector lens onto the gate. We don't need the projector lens, it is just convenient to have it there. This back light shines onto a piece of opal glass or a piece of tracing paper (detail paper might be better, it is slightly more opaque and is more flexible) so as to evenly disperse the light. The blue filter is also attached at this point. The automatic white balance on cameras doesn't work properly in this situation. You could fiddle with the video camera's manual white balance to get the same effect. There is a stroboscope attached to check the projector speed and a variable resister is also attached so as to adjust the electricity supply. The setting is very stable, one man can easily do this job. The oscillator is adjusted on this projector, on others it may be a governor to be adjusted or the fixing of a variable resister on the power supply. The Bell and Howell 16 mm film projector has a DC motor where the speed is locked electronically to the frequency of an oscillator (an oscillator simply produces an alternating voltage at a particular frequency. On the projector there are two preset controls for sound (24 fps) speed and silent ppeed (18 fps). If you know how, you can have an external control that supersedes these presets, and you can vary the oscillator frequency over a continuous range. Thus the projector motor speed will vary to match (eg.,10 fps to 30 fps). Now the picture on the DVD is very good. The colour is good because of the blue filter and there are no visible problems as the movie is being played. There is, however, a hidden fault - luckily one that can be ignored. You cannot see this fault while the movie Is being played. The defect shows every third frame. Look for an arm swinging. You will see that every third frame shows a cross fade from an adjacent frame. This third frame shows a bright clear image, but superimposed on it is a half faded image of the next movement. It is impossible to see it as the movie is played -- we see a smooth flow of motion. The “persistence of vision" property of the human eye (the same property that makes movies and video possible) fuses the images with a moving image. When transferring films that are dramas, the audio speed may be altered too much. You may then have to snip out parts of the audio or parts of the picture to restore lip sync. There are video editing systems that will speed-up or slow-down video pictures, slightly if required so as to restore lip-sync. Ideally you want a system which will change the length of the audio track without changing the pitch of the sound as it does so. Adobe Premiere does this. Some stand-alone sound programs can also change speed but maintain pitch. Bill has Ulead Video Studio 8 software. He has checked it and finds that it will lengthen or shorten the video. Corel Video Studio Pro X2, which is the upgrade of Ulead will also adjust the length of the video. Use the 30 day free trial to check if it suits you. The equipment set up is similar to the 16 mm equipment except that the projector is upside down and the video camera is the right way up. (The old Bell and Howell 8 mm projector made this simple.) The main problem with 8 mm film projectors is that the lighter motors do not have a very stable speed. Bill is working on this. This set up has a synchronous motor - it locks to the electricity cycles. The motor has a specially made pulley with a diameter such that it runs slightly faster than the required speed. That pulley has a second pulley attached to it which has a leather shoe lace rubbing on a part turn around it. Tension is pulled on the leather strip by a screw, so as to brake the motor to the required speed. It works! Bill has now removed the leather shoe lace - we now use a Variac (a Variable Voltage Transformer) to adjust the speed of the projector - 240 volts reduced to 170 volts got the speed exactly correct. We could now stand back without our hand on the control, it was as steady as a rock, it only needed an occasional very slight adjustment. This equipment should only be made by a competent gadget person because there are dangerously high electricity voltages involved. The splices on Standard 8mm film produce a knocking noise on the video. You have to use the audio from the original audio cassettes or reel-to-reel tape if available. Fortunately the old film makers tend to keep those cassettes. If that is not possible your must go through the soundtrack in your editing program and cut out each separate "knock". The splices on Super 8 and 16 mm do not produce this knocking noise. Handy hint: The rubber bands used in many parts of projector drives often perish and break. You may also want to make new belts for this sort of lash-up. To make a new rubber belt, get 'o' ring material sold by the metre and Loctite 406 glue from a bearing supplier. This glue is stronger and more durable than superglue. Trim the 'o' ring to length, and glue the ends of the 'o' ring together. Once stored in the computer's editing system it is possible to make changes to the pictures. As always the aim should be to capture the images as well as you can because tweaking in the computer never works quite so well. The trick is to work shot by shot and to make very small adjustments each time until you get close to the ideal. Using the Brightness and Contrast controls is the key to adjusting the exposure. Adjust the brightness first, then the contrast, then adjust the colour (saturation) to suit. On my Mac system I have found the image adjustment tools for photographs to be excellent, but not the ones for video. You need to experiment with the tools and filters available on your editing system ... but remember to save safety versions of the original transfers in case your adjustments do more harm than good! Constant speed motor with belt changeover for Silent/Sound (eg. 16 mm EIKI). You can sometimes vary these a little with a Variable Resistor. Fixed centrifugal governor with two settings for sound and silent (eg. Bell and Howell earlier 16 mm). A Series Resistor works here. You can take the Governor off the back and reset the silent contacts to 16 2/3 fps - but it’s tricky to get it spot-on. Constant speed motor with a variable drive (eg. a lot of Eumig models of 8/Super 8). This is good as long as you can get it down to 16 2/3 fps (usually the slowest official speed was 18 fps). You may be able to change a belt inside as they often had 2 belt settings - one for 50Hz Mains and one for 60Hz. In Australia and the UK the power is 50Hz and if you change the belt setting to the 60Hz setting it will go a bit slower on 50 Hz mains. Variable governor (this is an ideal system for our purposes) by Bolex 16 mm, Siemens 16 mm.